Although it may not seem like it at first, having the right shopping cart in your store makes all the difference. It is a resource that continues to be used when shopping for goods, which is why you need to really do your research before deciding on what type of cart you should order. 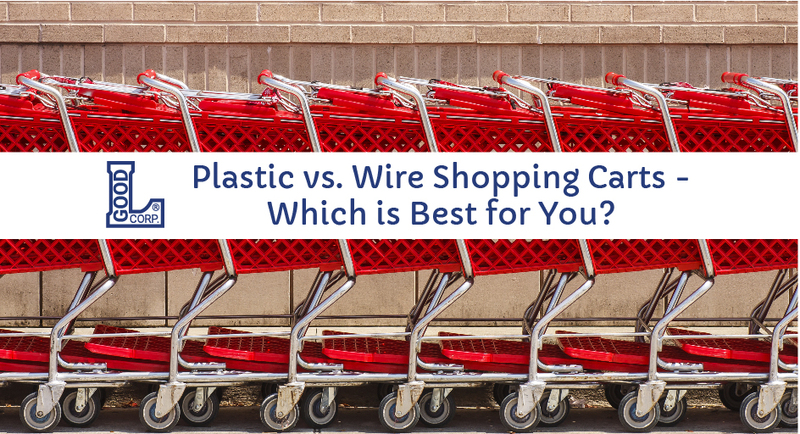 The most common types of shopping carts are plastic and wire. While they both have several similarities, as you will see below, they also have unique traits that should not be ignored when deciding on which is best for your store. At Good L Corporation, we offer a variety of color options that you can take advantage of for both wire and plastic carts. To learn more about the importance of giving your carts a little splash of color, read our previous blog post (https://bigbasketco.com/2015/12/24/how-to-positively-influence-shoppers-with-colors/) that goes into further detail about the benefits of color. We highly encourage having your company’s logo placed on your carts. Not only does it look good, but it also helps build your brand as well. Not to mention, if there were ever an instance where your cart was stolen, it would be easy to identify and claim. Both carts come with a great lower tray feature located at the bottom of the cart to help shoppers add on more goods. Without it, there would be limited space for items, which then decreases sales. Not every cart is the right fit for every customer. That is why we now offer three different sizes for our carts. Whether you have a customer that needs bulk items or just a space for smaller products, both plastic and wire shopping carts can handle it. We are proud to say that all of our products are created by Americans in the United States of America since 1989. As stated before, we recommend having your logo placed on your cart. However, when it is placed on a wire cart, it can be much easier to remove than a plastic cart. Therefore, carts without a logo are easier to be stolen by others. Without carts, your business could suffer exponentially. Although the wiring material used for a cart is durable, it is not indestructible. It has a higher risk of receiving damage than our plastic material, which is a thicker substance. If a wire cart gets ran into or comes into contact with something hard, it can take serious damage that will need to be fixed. Wire carts have a tendency to be louder than plastic carts, especially if they have a bad wheel that shakes the entire cart. The loud noise can be an annoyance for customers who would rather not be heard all throughout the store when shopping. Although it is true that wire carts can take serious damage, they are also a lot easier to fix than plastic carts. When a piece of a wire cart is damaged or broken, it can be easily mended with welding or another repair option. Plastic carts will need extensive care if they receive any sort of damage and typically, repairs are very costly. While 9 pounds is the lightest of our plastic shopping carts, wire carts weigh around 7.5 pounds! It may not be a drastic change, but when carts have to be pushed back to their return, it’s better to push the lighter cart. Ultimately, both carts have their pros and cons, but they both serve their purpose to help customers collect their goods. If you are still having trouble with your decision, give Good L Corporation a call at 855-823-6349 to go over the different options with our professional team. We are happy to help you in any way!